Just got back from Perth where I spent yesterday promoting my fight over there on the 13th, I was lucky enough to be hanging out with not only the promoters but Tino Ceberano who is also promoting the show and promoting awareness of street violence. We got to do a radio interview for Nova with Shaun Mcmanus, then did a luncheon at CoCo’s restaurant to promote the show plus a auction with a few items to raise money from breast cancer and the children’s hospital. Before the lunch time gig we went and visited the kids at the Princess Margaret Hospital for Children. I was a little worried going up thinking “oh man, none of these kids are going to know who I am and going to look like a goose”, another one of my worries is seeing really sick kids that never got a fair chance in life like the rest of us. When I got out of the lift in front of us was a little fella wearing his gym’s Muay Thai shirt with a tube in his nose and a very surprised Mum. We gave a talk to a few of the kids and their parents, I talked about my time in Thailand and Contender and Tino talked about why its not right to fight on the street, we took some photos and signed a few things for everyone that wanted one. One lot of parents got me to sign something for them and a photo before they told me “you have really put a little happiness in our day and so glade to meet you. We got a little bit of bad news this morning that our 3yo son has cancer tumours on the brain, he starts treatment soon and hopefully when he beats it and gets older we can show what you have signed for him”. Man I was hit for six and really had no idea what to say. Next the little boy I met before me in the lift come up with his Mum, poor little fella had tubes coming out of his nose and bandages on his arms. He really seemed genuinely excited to be getting a photo with me and when he put his hands up had a way more staunch guard then I did. When we left the hospital couldn’t help feel some what sad for these little guys who have to struggle so early just to stay alive. I just got back to the Gold Coast now I had a email from the mother of the little guy with the tubes. On behalf of my son Joel, I’d just like to say what a thrill it was to meet you at Princess Margaret Hospital for Children in Perth on Friday February 26th 2010. It was 9.50 am and you were coming in 10 mins so we bolted up to the Megazone only to realise Joel had to haave meds at 10.15! I don’t know who’s eyes bulged more when we went to step back into the elevator and saw you and your whole crew. You were all so polite and down to earth. When you acknowledged Joel and flashed that gorgeous big smile my eyes welled up! We flew up to his room, and he had to have a couple of pin pricks in his finger to take blood to test antibiotic levels in his system. 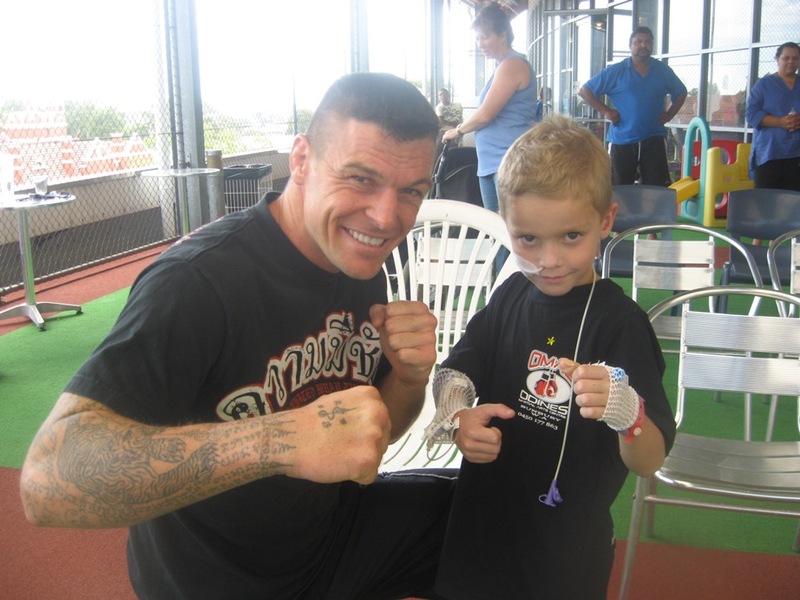 Of course he was hysterical for this, but as soon as I said “Do you want John Wayne Parr to see you crying Buddy” he snapped right out of it and we headed back up to see you all. So on behalf of my Husband Craig and Joel and Jeslyn thankyou from the bottom of my heart for visiting PMH. You really gave us reason to smile on Friday. Joel was born 10 weeks prem in February 2002 weighing 2lb 14oz. 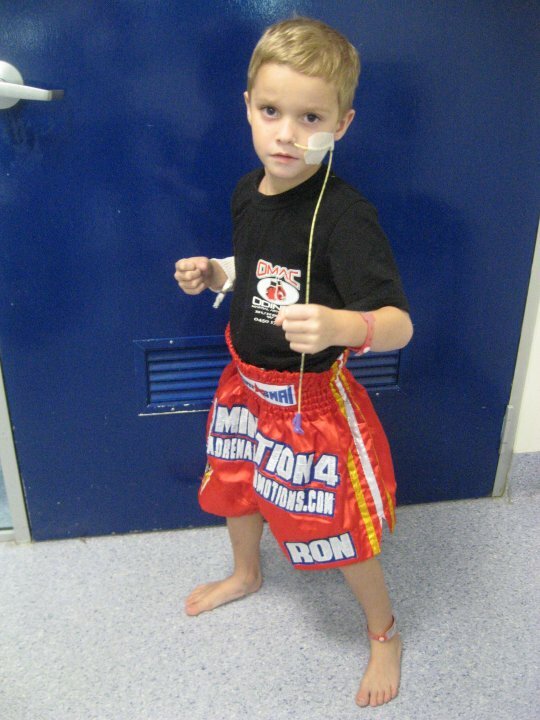 At 2 weeks of age he was diagnosed with Cystic Fibrosis. Little did Craig and I know we shared the gene that causes Cystic Fibrosis. We also have a little girl Jeslyn who’s 5 but she doesn’t carry the gene. Cystic Fibrosis is an inherited genetic disease. It is caused by a malfunctioning membrane that prevents salt and chloride ions being produced in the body thus resulting in the body producing a thick sticky mucus that blocks the Lungs, Pancreas, Salt Glands, and Reproductive System. Joel has Physiotherapy every day to remove Mucus from his Lungs. This is important because if he gets a chest infection the bacteria grow in the Mucus and this results in Lung damage. It is a progressive disorder which means every Chest Infection he gets causes more Lungs damage resulting in a short life expectancy. Most CF kids will need a Lung Transplant in their 20’s or 30’s. Joel is very energetic, he loves to swim, ride, he has a scooter and a go kart and we have a small pool in the back yard. I started Muay Thai at my brother in law Gary Odine’s gym in December and have to admit, I feel better in myself and more confident! It wasn’t until start of school year that I made the decision to start Joel and Jeslyn taking Muay Thai with Uncle and now I’m so glad I did. They both thoroughly enjoy it. 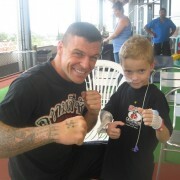 But THE best part is Joel now has a real life idol, John Wayne Parr! We used to use The Hulk or ben 10 as examples. “Mate if you drink all this up you’ll get muscles like the Hulk!” to my delight only a month ago he said “will I be big and strong like John Wayne Parr?” Mummy’s eyes welled up, because Joel is also Intellectually handicapped, awaiting Autism Assessment, so for him to realise you as an idol of his own accord was very special to me. Can’t wait to see you fight against Valent! We have a whole busload coming up to watch. I hope one day we meet again and you can autograph Joel Boy’s Gloves! I only hope one day we can get you to do a little Publicity for Cystic Fibrosis! I’m sure we will be calling into Boonchu one day when we get his Make a Wish Foundation Wish along with heading to Seaworld & Dreamworld of course! It takes a special person of your stature to stop and take time to brighten the day of sick kids. 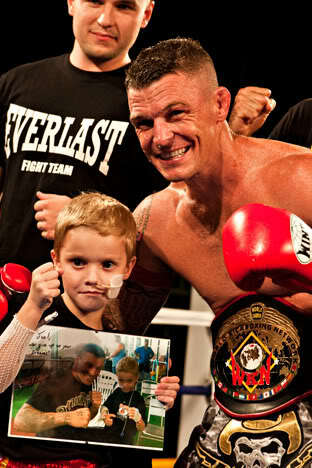 Thank you, JWP, for putting smiles on the faces of those children, one brave boy, and some very special parents. 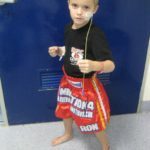 With your enthusiasm, energy, and drive, hopefully we will raise more money to fight CF so these little champions will be able to jump in the ring one day too. Your story is inspirational, and you are a warm, humble man.